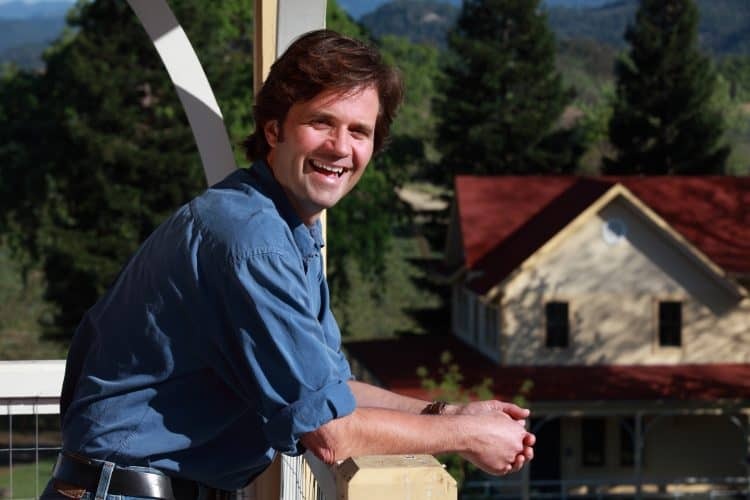 Meet David Beckstoffer, President and Chief Operating Officer of Beckstoffer Vineyards in Rutherford, CA. As a second-generation farmer who started out in the corporate world, he now loves walking through his vineyards and working alongside his dad. Learn more about David, how his family branded their vineyards and why he says making guitars helps relax him. CA GROWN: When did people start putting your name on their wine bottle labels? David: That was really my father’s doing. He started branding our vineyards 20 or 30 years ago. During the 80s and 90s, a lot of wines were recognized more by the name of the winery and not the vineyard. He changed that around by promoting some of our vineyards and put them in a class called our Heritage Vineyards. If wineries bought grapes from these vineyards, they were required to put the name of the vineyard on the label. By doing that, we gradually built up the brand of these specific vineyards, so now some of these vineyards and our name are more recognizable on certain wine labels than even the winery names. So that’s something my father started for our business and now it’s not unusual to see all kinds of vineyard names on bottles and it’s more common now that vineyards are as well-known as certain wineries. Although my dad wasn’t the first to do this because there were other vineyard-designated wines before that, he really did it on a much larger scale and did it with different vineyards that we own rather than one family vineyard. CA GROWN: You’ve recently launched your own personal label, can you talk about Kata and Ghost Dog? David: So I have two roles, I’m president of Beckstoffer Vineyards which is the farming company and we own vineyards and farm grapes that we sell to wineries. I also have my own private project that is my label and the two wines are Kata and Ghost Dog. I actually buy grapes from the family company, so I’m kind of a client of the farming company as well as the president of the farming company. The two wines are owned by me, but the farming company is the family company that’s owned by my father. CA GROWN: How long have you been producing your own wine? David: The first vintage was 2011, so I’ve been buying grapes from the family company since 2011 and right now, we just released our 2014 vintage so that was our fourth release. David: No two days are ever alike and I don’t have a set schedule where I come in and do one thing for an hour and then something else for an hour. Today for example, I’ve got a lunch meeting with a guy working on sales for my wine project. In the afternoon, I’ll be working on contracts because right now, we’re selling grapes to wineries and getting contracts ready for the 2017 harvest. I’ll also go out to the vineyards and check on how the pruning is coming along. I don’t get directly involved in the field workings because we have vineyard managers that do that. But I do like to get out there and see how things are coming along. Right now, we’re at the tail end of our pruning season and in the next few weeks, the buds will start coming out and the vines will really start growing for this season. Then a lot of my day is waiting to see what happens. Sometimes I’ll get a phone call or email and I spend an hour or so working on something from that. David: It depends on my mood, but my favorite thing is going out in the fields on a nice day and seeing these plants, the land and our guys out there. It’s farming at its core and that gives me a thrill. Other days, it’s interesting to look at the business side of things because a lot of people think farming is a very low tech and simple operation, but there really are a lot of moving pieces. We not only have to worry about labor and managing people, we also have equipment and we have to worry about farming, planting and cultivating. So some days I’m really into being out there in the field and other days, I’m into the business side of things and it gets me excited to see what we’re doing from a business standpoint. David: We’re very involved and we’re actually involved in three different communities. We have vineyards in Napa County, Mendocino County and Lake County, so those are our three farming areas. We’ve tried to be involved in all three communities and we financially support a variety of causes. In Napa, we’ve donated a lot to the Boys & Girls Club and OLE Health. In Mendocino, we’ve donated to their Boys & Girls Club, schools and other social and community projects related to the industry. We also donate to community-based projects that promote schools, helping people that aren’t well-off or things like that. David: I joined the company about 20 years ago in 1997 and before that, I was in an entirely different industry. I was in finance and worked in San Francisco where I did a lot of traveling and international work. I was very much in the corporate world and after doing that for about 10 years, I really thought about what I wanted to do with my career. I was at a crossroads in my last career and I decided that instead of going higher in the corporate world, I decided it would be a good change for me to join the family company, live a different lifestyle, work with my father and become a farmer, although I still think of myself more as a businessman. David: I’ve got a few and one of the things I love to do is woodworking. I have a little shop at my house that’s more of a toolshed really, but I like to make guitars. It’s something I don’t make a living at, but every now and then I sell a few and I donate a lot. Just the process of making an instrument like that grounds me and it’s a nice escape from everything else I’m doing because I just close the door and go in my shop to work with wood, so it’s definitely one of my passions. I make about one guitar a year now, but I used to make about two or three a year. I basically make them at my own pace and when they’re done, sometimes people will buy them or sometimes I’ll just hold on to them for a while. David: I think one of the things you have to realize in farming is that it’s a risky profession. Everything is at the whim of Mother Nature and you can do a lot to try and control that, but in the end you’re very vulnerable to what nature throws at you. To be a farmer, you have to be comfortable with that. In my time in the industry, I’ve seen very good years, very bad years and a lot of years in between, but you just have to roll with it and know that no two years are going to be the same. Some years you’ll get lucky and other years you won’t. You can do certain things to try and mitigate your losses in a bad year, but in the end farming is about nature and you need to be comfortable with that.